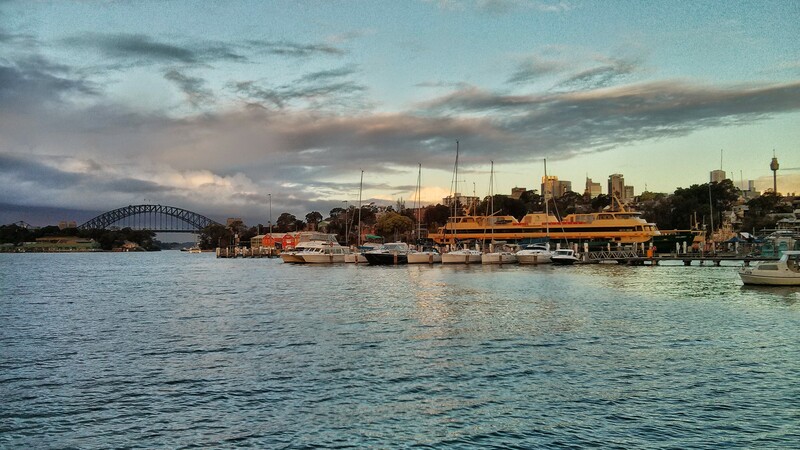 The view from Balmain Wharf is pretty fantastic. A couple of friends (from high school) and I spent about thirty minutes there yesterday, waiting for a ferry to arrive. “There’s nothing quite like a ferry ride in Sydney to make me feel good”, I told them. “It’s like when a dog hangs its head out the window”, I added, noting the physical sensation of sitting up front of a ferry, rather than being stuck inside. We had spent the last few hours enjoying lunch at The London Hotel (John Dory x 2, and Tenderloin x 1, both of which tasted terrific) and as we waited, we were all a little overwhelmed at how beautiful the clouds were, the harbour was, the bridge looked and the light was. Thought I’d share. Beautiful indeed and such lovely light.